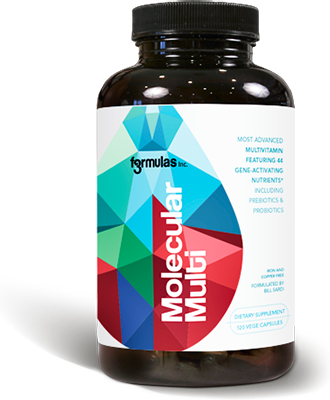 THE MOLECULAR MULTI – formulated by Bill Sardi – is designed as a 4-capsules-a-day multivitamin. Cost-conscious consumers can take 2-capsules/day and still get more nutrients than most other multivitamins. THE MOLECULAR MULTI, 120 capsule bottle, a full 30-day supply, suggested retail price is $57.50. Buy 3 bottles and get 1 bottle free (total price $166.50 or $41.63 per bottle / $1.44 per day). The Molecular Multi provides vitamin A in its fatty form, retinyl palmitate, [National Institutes of Health] and also as beta carotene which converts to vitamin A when consumed with dietary fat. This water soluble vitamin gives urine its yellow color. Riboflavin is a light (sun)-sensitive that should not be consumed in doses exceeding 10 mg/day as it may wrinkle skin and the retina when combined with intense sunlight exposure. RDA is 1.1-1.3 mg for adults. Deficiency symptoms are cracks on outside of lips, swollen tongue. Myriads of symptoms are produced from niacin deficiency including diarrhea, constipation, lack of stomach acid, tongue inflammation (glossitis), sore mouth, dry lips, depression, irritability, dizziness, dementia. Niacin is required for cellular metabolism and invigorates cell energy compartments called mitochondria. While deficiencies of vitamin B5 are not well documented a shortage of any B vitamin suggests a shortage of all. All B vitamins help convert food (carbohydrates) into fuel (glucose). Recommended daily intake is 5 mg for adults. B5 improves secretion of adrenal stress hormones; should be the first nutrient given in cases of adrenal fatigue. B5 is said to mimic the steroidal anti-inflammatory agent prednisone. Pyridoxine is a nutritional co-factor. Without B6 magnesium cannot be utilized. B6 is involved in sleep regulation. Eating a B6-rich banana before bedtime is known to induce restful sleep. As humans age, proteins begin to crosslink when sugars begin to react with them (called glycation) which leads to sagging, wrinkled skin, blood vessel damage and nerve damage. B6 is provided as pyridoxyl 5 phosphate in The Molecular Multi. Sometimes B6 does not efficiently convert to its active form, pyridoxyl 5 phosphate, the active form of B6. This form of B6 counters some of the adverse effects of a high sugar/high carbohydrate diet. Known as the essential vitamin that prevents birth defects (spina bifida, anencephaly). Over jealous health authorities have over-dosed pregnant women (5000 micrograms) on folic acid and ended up increasing the risk for autism dramatically. Folic acid is not a monster vitamin. It is unfairly disparaged as increasing the risk for cancer (really, it had no effect). Folic acid is required for DNA repair and precancerous cells will develop without this vitamin. The food form of B9 is folate and the oxidized form is folic acid. The liver must metabolize folic acid to folate and a large percentage of people are unable to do that. Un-metabolized folic acid may remain in the blood circulation when doses exceed 200 mcg. Most multivitamins provide 400 mcg folic acid. Folate at a lower dose (200 mcg) is probably best. The Molecular Multi provides vitamin B9 as folate. Probably 4 of 10 adults over age 50 have a shortage of vitamin B12. The same amount is in their diet but it just isn’t getting absorbed as they age. The RDA is 6 micrograms and at least 30 mcg is needed, maybe 300 mcg or more. B12 blood levels are meaningless since people with normally-found blood levels (called the reference range) often report improvements with supplementation. Symptoms are pervasive and sometimes obvious, such as short-term memory loss, sore tongue, burning feet, fatigue, unexplained chronic cough, back aches and fatigue, yet patients walk in and out of doctors offices every day with these complaints are physicians are oblivious. B12 is also a strong inhibitor of homocysteine, an undesirable blood protein that is associated with mental depression and nervous system disorders. Methylcobalamin is the predominant form in the blood circulation and preferred form in dietary supplements. Cyanocobalamin, commonly sold, is derived from cyanide. The Molecular Multi provides B12 as Methylcobalamin. Vitamin C is the one vitamin pill you would need if stranded on a desert island. There is a widespread misconception that vitamin C-rich foods (oranges, kiwi, papayas) provide sufficient amounts. But 60 mg vitamin C, the amount in an orange, is not enough to even raise blood levels. Most animals internally produce vitamin C (except apes, fruit bats, guinea pigs). Animals will produce thousands of milligrams of vitamin C per day and more under stress. Mammals that produce vitamin C do not get heart attacks. Lack of vitamin C induces unstable coronary artery plaque that can rupture and induce a heart attack. The greatest error involving vitamin C (aka ascorbate/ alkaline form; ascorbic acid/acidic form; Ascorbyl palmitate/ fat-soluble form) is that the absence of scurvy symptoms (hemorrhages, irritability, lassitude, aching joints) suggests sufficiency. Weak blood capillaries (connectors between arteries and veins) result from lack of vitamin C leading to leakage of serum into surrounding tissues and inflammation or in more overt cases, leakage of red blood cells = hemorrhage. Bleeding gums, red blotches on back of the hands (ecchymoses), red hemorrhages on the white of the eyes (sub-conjunctiva), poor wound healing, are other symptoms. Vitamin C is required for connective tissue healing. This vitamin is depleted by aspirin, ibuprofen and acetaminophen (Tylenol), which are usually taken when ill with infectious disease. As a water-soluble nutrient vitamin C is rapidly excreted (30 minutes). A combination of vitamin C w/bioflavonoids slows absorption and thus helps maintain prolong blood levels (bioflavonoids should be 60% of vitamin C dosage). Slow-release C (variable-size beadlets) also available. Vitamin C prevent iron-deficiency by facilitating absorption of iron and makes more iron available from the kidneys (works like Procrit drug). Works as antioxidant by donation of electrons. Is natural antihistamine. Germs and cancer increase demand for vitamin C. Vitamin C championed by Dr. Linus Pauling in the 1970s-80s as remedy for heart attacks, cancer and the common cold. The late Abram Hoffer MD used 3000 mg vitamin C 4-times a day + 30 mg zinc to prolong lives of cancer patients. A gene mutation many generations ago made humans completely reliant upon dietary sources of vitamin C. Since few is any humans regularly consumes as much vitamin C as produced naturally prior to this gene mutation, it can be said that 100% of the human population is deficient. The Molecular Multi provides vitamin C in it acidic form, ascorbic acid, and in a fat-soluble form, Ascorbyl palmitate, which is retained longer in the body. Actually a hormone, not a vitamin, produced in the skin and stored in the liver. This sunshine vitamin, 30 minutes of total-body mid-day (10AM-3PM) sunshine = 5000 IU vitamin D. Less D is produced in dark skinned individuals. Low vitamin D levels = neutropenia (lack of white blood cells called neutrophils). Active white blood cells linked with “cancer proof mice.” Vitamin D was confined to rickets (bone softening) and not properly investigated for immunity for many decades. Vitamin D is necessary for utilization of calcium and magnesium. Winter months in northern latitudes very few people are vitamin D sufficient. The diet provides very little vitamin D (400 IU in fortified milk = ~1 minute of sunshine). Use of sunscreen agents increased risk for malignant melanoma by inducing decline in immunity. High dose vitamin D is very effective at reducing fevers, particularly young children (safer than aspirin). Cholecalciferol is natural D3 from sheep lanolin; ergocalciferol is synthetic vitamin D2 (mushrooms). 5000 IU vitamin D3 = 125 micrograms by weight. Vitamin D also facilitates muscle tone. Over-dosage (hypercalcemia) is over-stated and usually seen in lab animal studies where the equivalent of mega-doses (1 million IU) are employed. Some are reluctant to take 5000 IU supplemental vitamin D but not 30 minutes of sunshine, which produces same amount of natural vitamin D. Vitamin D is good for allergy too. Winter is the season for mental depression, heart attacks, influenza and cancer, all related to vitamin D deficiency. Vitamin D levels need to be checked for every patient admitted to the hospital given the relatively high rate of infection (example: pneumonia) and antibiotic resistant germs. High-dose vitamin D produce germ-killing cathelicidins. Mega-dosing: 50,000 IU vitamin D3/day can be taken for days without side effect. Doctors inject over 1 million units vitamin D in a single day for wintertime bone protection without side effect. The Molecular Multi provides vitamin D3 as cholecalciferol, the natural form of this vitamin. A fat-soluble antioxidant. Member of the two families of vitamin E, Tocopherols and Tocotrienols, are designated as alpha, beta, delta and gamma forms. A balanced multivitamin will provide both families. While vitamin skeptics errantly claim high-dose vitamin E increases risk for death, it simply lost effectiveness beyond 400 IU. Probably 200 IU is sufficient. The blood-clotting vitamin. Because first generation blood thinners (Coumadin, warfarin) were vitamin K blockers, patients were unduly made fearful of vitamin K, a vitamin necessary to prevent arterial calcification. Vitamin K is also approved overseas for bone health. Vitamin K is naturally produced in the intestines under normal circumstances. 25% of Americans eat diets very low in choline. Choline is a stellar liver cleanser. Probiotics + choline helps with insulin resistance. Useful to promote ovarian health. Useful to allay anxiety. Calcium, that widely heralded mineral that comprises most of bone and sells over $2 billion in calcium supplements, is over-rated and even problematic. North American diets are already rich in calcium from dairy products. The supplement industry refuses to deal with the science – post-menopausal women who take calcium supplements are at greater risk for mortal heart attacks. Why? Because the additional calcium doesn’t enter bone and stay there, it leaches out into the arteries and stiffen (calcifies) them. The problem of osteoporosis is due to a lack of estrogen, not calcium. Estrogen sends a signal to hold calcium in bone. Calcium is not provided in The Molecular Multi. Rely upon the diet for calcium. There are so many good reports that beg health-minded consumers to supplement their diet with magnesium. This muscle relaxant, natural calcium blocker and enzyme co-factor is so critical to the human body. When farmers began using phosphate fertilizers nearly a century ago the amount of magnesium in the American diet plunged. Some studies show at least 4 in 10 Americans don’t consume enough magnesium. You get magnesium out of green leafy vegetables but you need to eat a lot to meet your needs. Magnesium is also critical for proper vitamin B1 thiamin utilization. A bulky mineral, in adequate doses (200-400 mg) it needs to be consumed separately from a multivitamin. Magnesium oxide is the most economical dietary supplement but while cheap, only 4% is absorbed. More beneficial forms are mag orotate, malate, citrate. Magnesium threonate is touted for the brain and most users remark its effect is quite demonstrable. Magnesium should be tried for cluster and migraine headaches. Magnesium is required to product ATP (adenotriphosphate), the energy unit in living cells. Magnesium is provided as magnesium citrate in The Molecular Multi. Potassium is provided as potassium chloride in The Molecular Multi. Boron is a mineral that helps in the utilization of other minerals such as magnesium and phosphorus. Boron also increases estrogen and testosterone levels. There is no Recommended Daily Allowance for boron. Most boron supplements supply 3 mg and 20 mg appears to be safe. In 1994 it was reported that boron intake levels from food ranging from 3-10 mg/day the incidence of arthritis ranged from 0-10%. In areas where boron intake was 1 mg or less per day arthritis incidence was 20-70%. [Environmental Health Perspectives 1994] This effect may be due to better utilization of magnesium. Boron is provided as boron chelate in The Molecular Multi. Chromium Picolinate is the form of this vitamin provided in The Molecular Multi. Copper is a strong oxidant. It is required for connective tissue (collagen) formation. Donald Miller Jr MD has done the best job of describing the need for iodine heightened by chemicals (fluoride, bromide and halogens) in the environment. Miller cites evidence increased consumption of iodine-rich seaweed in Japan dramatically reduces the risk for breast cancer and fibrocystic breast disease there. Iodized salt is sold but 45% of American families buy non-iodized table salt. Iodine is a disinfectant. Like selenium, iodine is needed to convert T4 to T3 thyroid hormone. Miller notes that 150 mcg of iodine will prevent goiters but not breast disease. Iodine is provided as potassium iodide in The Molecular Multi. Provision of manganese in multivitamins is considered to be important because manganese/SOD (super oxide dismutase) is the principle enzymatic antioxidant in mitochondria, the cellular energy compartments. Manganese sulfate is the form of this trace mineral provided in The Molecular Multi. Selenium is a trace mineral that is generally well provided in the American population. Selenium is required to convert thyroid hormone (T4 to T3); selenium is needed with vitamin E to produce glutathione peroxidase, an internal antioxidant. However, it is critically needed to (1) balance copper; (2) zinc works with vitamin A to enhance immunity; (4) zinc is needed to produce stomach acid; (5) alcoholics may experience loss of night vision due to impaired zinc nutriture; (6) zinc has something to do with prevention of atrial fibrillation; (7) zinc is necessary to maintain thymus gland function to activate T-cells; (8) zinc is the first nutrient that should be supplemented in cases of alopecia and anorexia; (9) zinc facilitates the sense of smell; (9) zinc acetate lozenges reduce the duration of a cold; (10) zinc is required for wound healing (burns); (11) zinc shortage is associated with autism. Americans consume ~10 mg zinc/day but maybe absorb 2 mg. The ratio zinc/copper ratio should be 10 mg to 1 mg copper. RDA for zinc is 11 mg/day women, 8 mg/day men. Frank zinc deficiency can induce symptoms of diarrhea, diminished appetite (the link to anorexia), impaired taste, skin problems (rash, impetigo in children, warts, folliculitis, hair loss, Athlete’s foot). Maybe 7 of 10 Americans are zinc deficient. Zinc blood tests are notoriously inaccurate. Vitamin B6 is a co-factor with zinc. Zinc citrate is a preferred form of zinc. Provided as zinc citrate in The Molecular Multi. Astaxanthin is the pink pigment we see in the feathers of flamingoes. It is the antioxidant component of krill oil. It is obtained from crustaceans they eat. Astaxanthin exhibits broad biological action as evidenced by documented improvement in walking (elderly subjects), sperm count, solar skin protection, memory, glucose control, physical performance and visual fatigue. The orange pigment in carrots, it converts to vitamin A (pro vitamin A) when consumed with dietary fat. Unfairly demonized in 1994 just prior to the passage of the Dietary Supplement Health & Education Act that kept supplements from being declared drugs, beta carotene does not increase the risk for lung cancer among smokers. Only smokers and alcohol drinkers who take high-dose beta carotene are statistically (but not meaningfully) at greater risk for lung cancer. [International Journal Cancer 2014] Smokers and drinkers are least likely to be taking high-dose beta carotene supplements. To conclude beta carotene increases the risk for cancer is like saying carrots cause cancer. Beta carotene supplementation (15 mg/day) may reduce uric acid levels. Lutein is a yellow pigment derived from marigold flower petals and extracted for dietary supplement use. Lutein is found in the skin where it acts as a sunscreen and prevents skin wrinkling. In the eye serves as a blue light filter in the visual center of the eye (macula). Improves contrast sensitivity (seeing shades of grey). Converts to zeaxanthin in the retina. 6-10 mg/day is suggested for eye protection. More obese individuals store lutein in fatty tissue and it has greater difficulty getting to the retina. Lycopene is the red pigment in watermelon and tomato. Promotes prostate health. Activates internal antioxidant enzymes. May inhibit age-related bone loss. Improves sperm quality (4-8 mg/day). Protects skin from sun damage. Derived naturally from apple peel or red onions, is a natural antihistamine. Q has strong antiviral properties. Chelates (binds to) iron. Strong antioxidant. Works synergistically with other polyphenols like resveratrol. Found natural in grapes, peanuts and mulberries, it is 1000-fold more concentrated in fermented wine. It is a key molecule in wine that has broad biological action as anti-clotting, antidepressant, antioxidant, anti-inflammatory, anti-bacterial, anti-viral, anti-fungal properties. Is a molecular mimic of a calorie-restricted diet. Activates Sirtuin1 survival gene. Reinvigorates energy in mitochondria. Transiently activates nitric oxide gas to dilate (widen) blood vessels. Switches on Nrf2 gene that activates internal antioxidants. Enhances the effects of drugs. Overcomes drug resistance. Has profound biological action. Chelates (attaches to) copper. Works synergistically with other polyphenols like quercetin, catechin. The antioxidant power of cloves is far greater than any other molecule tested. Often used as an antioxidant stabilizer in oils. This polyphenolic herb is widely heralded and underutilized. IP6 (six molecules of phosphorus, 1 inositol molecule) is nature’s mineral chelator. IP6 dissolves calcifications and binds to iron, copper and heavy metals like lead, mercury, cadmium. IP6 should be used for iron overload. IP6 addresses iron/copper-induced oxidation and by cleaving to hemoglobin and taking the place of O2, reduces oxygen-induced oxidation, the only molecule to do this. IP6 is a profound anti-cancer molecule as it binds to iron and copper, which are growth factors for tumor cells. Processed food diets provide little IP6. This molecule has been demonized as an “anti-nutrient” because it allegedly reduces availability of iron, zinc and other minerals. IP6 is found in every cell in the body and is required for life. An enzyme from papaya that breaks down proteins. Useful digestive aid. Anti-inflammatory. Breaks down fibrin and therefore degrades existing blood clots. Beta cyclodextrin is a plant-derived sugar-like molecule that is used to solubilize drugs. It is utilized in Niemann-Pick disease, an inherited condition where young children can’t dispose of cholesterol. Cyclodextrin has promise for eradication of oxysterols (cholesterol deposits) in the retina, called drusen. Cyclodextrin may be helpful in reduction of beta amyloid plaque in the brain. But for both eye and brain, the question remains whether this molecule actually crosses barriers in the brain and eyes. Cyclodextrin may be particularly helpful as a solubilizing agent for resveratrol, a red wine molecule. Non-pathogenic acid-forming bacteria that elevates immune response. As an extract of black pepper fruit, bioperine helps other small molecules make it past the liver detoxification system and therefore improves nutrient bioavailability. It also enhances the effect of drugs, so dose may need to be reduced. It is mistakenly said Bioperine improves nutrient absorption. Promotes beneficial bacteria in the gut. Improves immunity. Helps to control appetite. Supports healthy cholesterol levels. Binds to iron. Taurine is the precursor to bile and helps improve bile flow and may be useful in cases of sludgy bile or gall stones. Nucleotides (adenine, guanine, cytosine, thymine) are the steps on the DNA ladder. The body retains a pool of nucleotides to facilitate DNA repair. Nucleotides can be acquired from the diet (lentils are a good source). Supplemental nucleotides are provided to astronauts and prematurely-born infants to improve immune response, wound healing and growth.